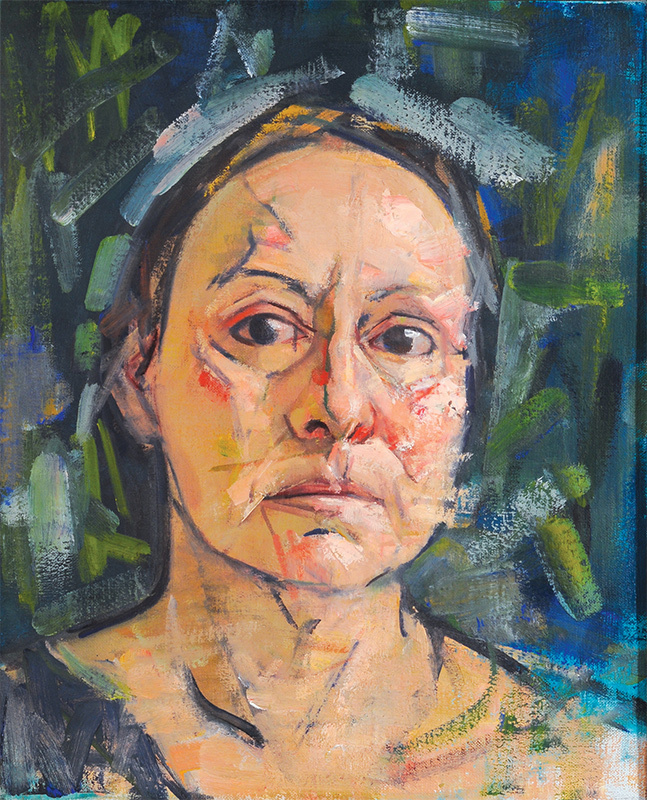 Mary Beth McKenzie, Self-Portrait (Green Background), 2009. Oil on canvas, 18 x 14 in. Has it ever been difficult supporting yourself as an artist? I think it’s important to be able to paint exactly what you want. For me that meant not having to do illustrations or take portrait commissions for a living. I had to be independent, even if that meant taking a non-painting job, so I could do what I wanted with my work. I didn’t want anybody, even my husband, who is a photographer, having a voice in my work—actually, especially my husband, because I didn’t want suggestions from someone that close. I needed to be able to say, “I’m going to my studio.” I didn’t want any influences. It’s a purity that I want to keep in my work. I think I was prioritizing, finding a way. IG: When did you feel that you were an artist? MBM: That’s a hard question. I think when my self-portrait was hung in the Metropolitan Museum that totally did it. It countered all the bad (or non-existent) gallery experiences. This one sense of accomplishment, which continued as the painting hung for eight months, was very healing. Also, and maybe more importantly, because I myself felt that my painting held its own against the other paintings. Many of the artists included in this exhibition were painters that I had always loved. IG: Did you have any good gallery experiences? MBM: I did early on, but then I really haven’t since then—Farr Gallery, Frank Caro Gallery, Joseph Keiffer Gallery—all closed, about 1992. 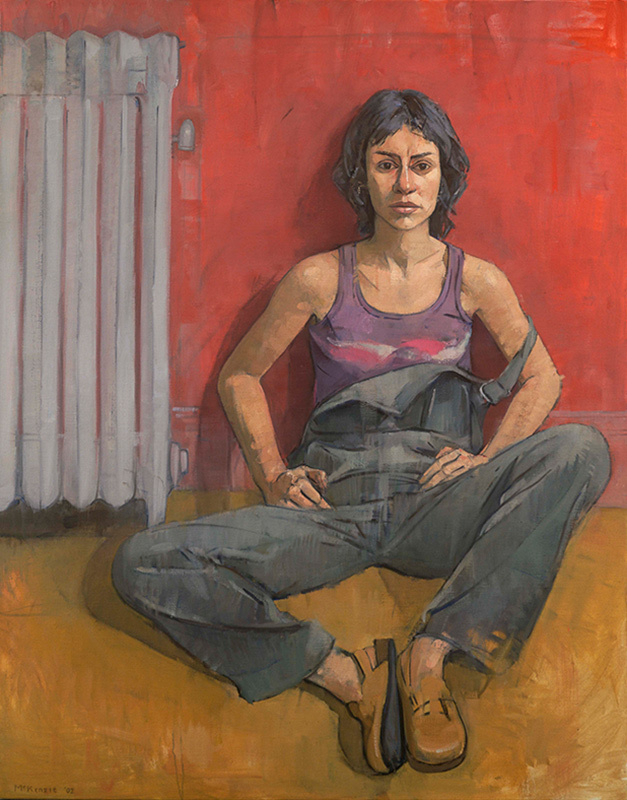 Mary Beth McKenzie, Amaya, 2002. Oil on canvas, 50 x 40 in. IG: Are you still painting the figure? Is that your main subject? MBM: Yes, I have always been preoccupied with the human figure, people alone or in relation to other people or objects. I also love doing monotypes. IG: What is it about the monotype that excites you? MBM: I love that they have to be done so quickly. 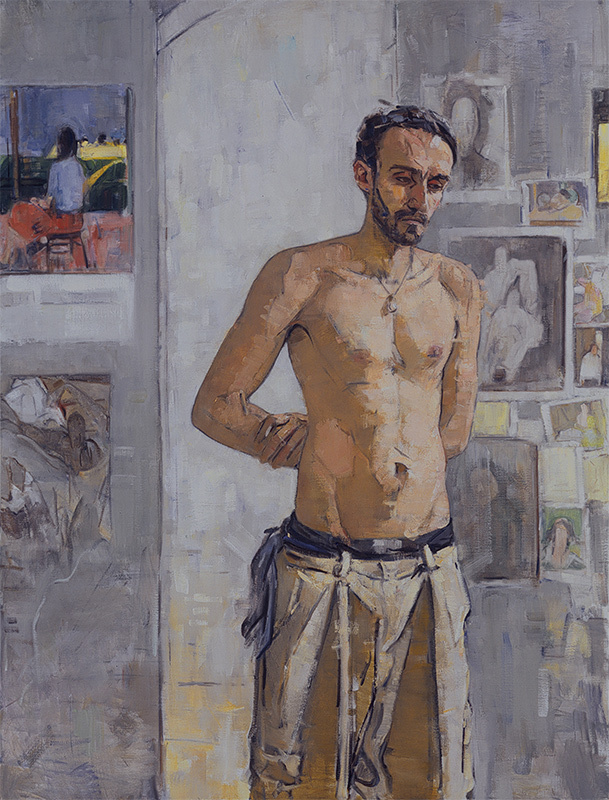 I work on my large figurative work over a long period of time with repeated sittings. For me, doing a monotype is a breath of fresh air. They are very spontaneous and the end result is always a surprise. They work, or they don’t work. You only have one shot. Unless you print in less than three hours the paint dries and you lose all sense of contrast. I find them an ideal medium for New York City scenes that I am drawn to, because you don’t need as much information. IG: There’s less thinking involved. MBM: I find them fun. Not easy—because they are so unpredictable—but fun. For the Circus series, I did some of them four times, until I finally got what I wanted. IG: Most of your canvases are big. Is there a certain intimacy you have with the female nudes? They have a certain sensuality that is notable. MBM: I just love form, and to be able to work big, using a big brush. When I’m not doing that, I miss it. I do monotypes for a while, and I get very involved in them, and then I just need a bigger project. People have always been my biggest fascination. 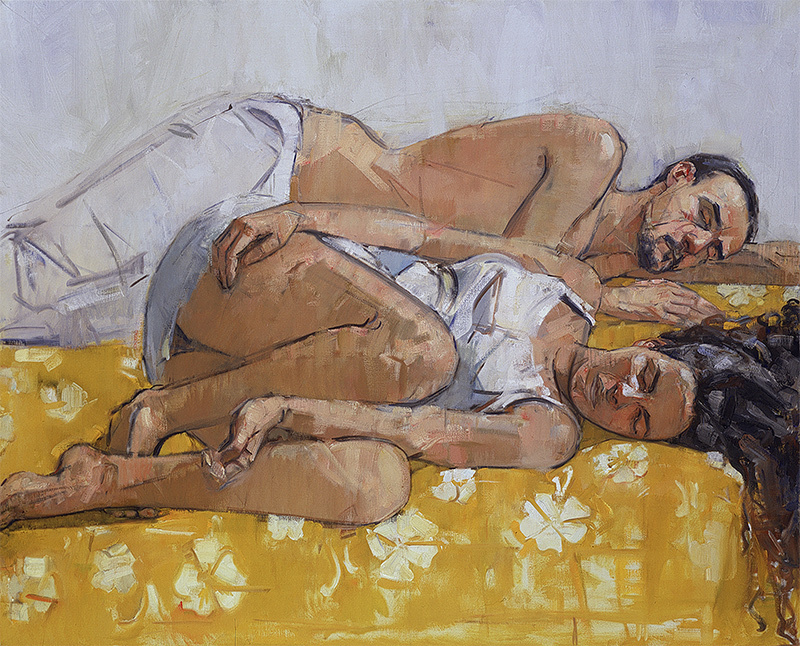 Mary Beth McKenzie, Sleep (Christina and Beñat), undated. Oil on canvas, 48 x 60 in. IG: Is it the tactile quality of flesh you’re attracted to? MBM: It is the color and the sculptural form that is very exciting to me. People excite me, and often I don’t even know why they excite me. I look at somebody and I want to paint them. I should be able to define it more, but I guess I define it with paint, not words. IG: Is there anything you would like to do that you haven’t? Something more allegorical, narrative, or is this what you like doing? MBM: I guess it is what I like doing. IG: Who are your artistic heroes? MBM: Van Gogh was the first: The Large Plane Trees (Road Menders at Saint-Rémy) in the Cleveland Museum. I fell in love with that painting. Rembrandt and Velázquez have always been giants. That doesn’t mean I don’t like other artists. 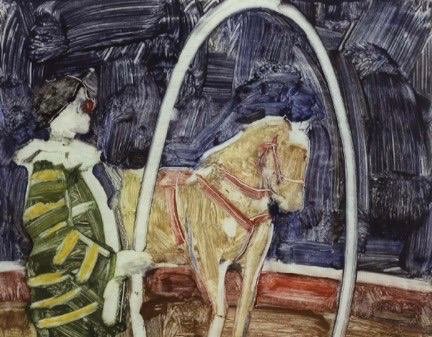 I love Matisse, Egon Schiele, Diebenkorn, and Lucian Freud. Käthe Kollwitz has always been a big favorite. I think who you love also changes as you’re busy with line or you’re busy with something else. 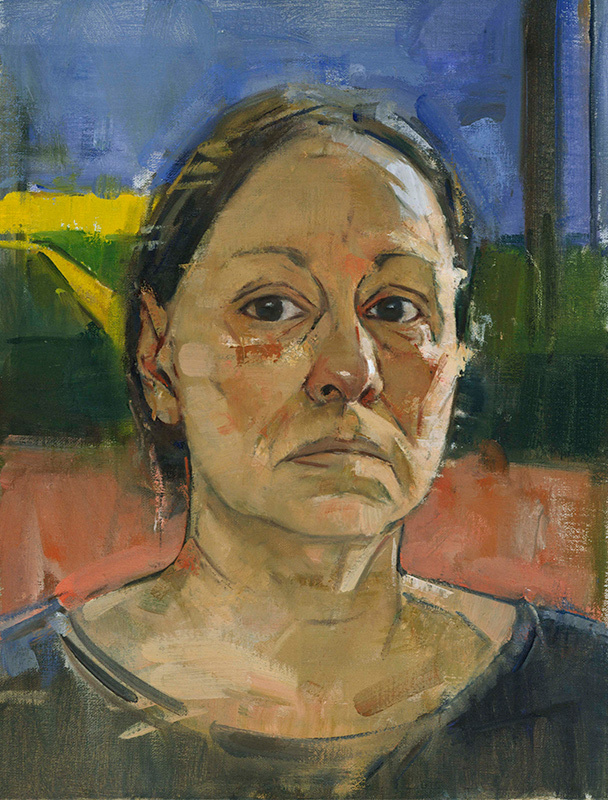 Mary Beth McKenzie, Self-Portrait (Matisse Print), 1991. Oil on canvas, 32 x 25 in. Collection of the Metropolitan Museum of Art. IG: Any people you used to love that you don’t love anymore? MBM: Interesting question. I have to think about that. Things change. It doesn’t mean I don’t like them. I’ve gone through phases with different Impressionists. I love Cézanne. That’s not going to change. IG: Did you always love him? I had to learn how to love him. I didn’t get it right away, but once I saw it, it really knocked me over. 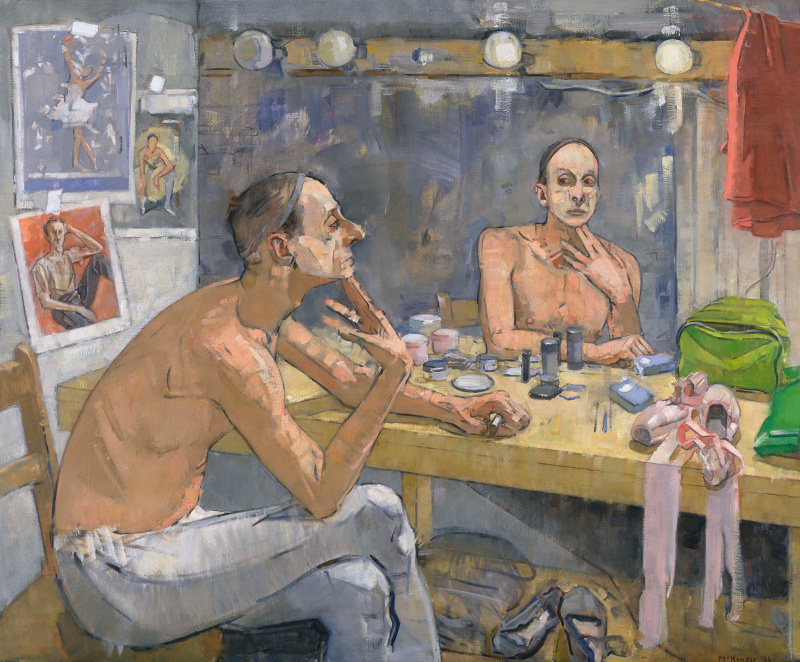 Do you feel you have a dialogue with your art when you paint? MBM: I don’t know what you mean. IG: I used to say that the difference between the student and the professional is that the student needs the instructor to tell him what to do; the professional needs the art to tell him what to do. MBM: Then, yes. I think the painting has to dictate, has to be allowed to lead you somewhere. If something happens in the painting that is better, you have to follow it. IG: Well, when you’re painting two people, you stick with painting two people, you don’t realize all of a sudden that the composition is changing or radical rethinking of the painting is required? MBM: Well, I’ve added a third person. Mary Beth McKenzie, Dying Swan, 2006. Oil on canvas, 60 x 50 in. MBM: I have. But I think composition is probably the most important element in painting, so I spend some time in the beginning. I didn’t initially when I started painting; I was too anxious to paint. Then, I’d spend days with a big painting that was complicated, moving everything over just a little. I don’t do much preparation really, I guess. I do a color study, and from that, small compositional studies. I generally stretch my canvas after I have decided on the composition. IG: You don’t do a preliminary drawing? MBM: Not a real drawing. You know, more like a circle for a head, just so I can place the figures. I am interested only in a very rough placement. I always go back to the subject and work directly from life and make adjustments. IG: Do you go through any kind of different psychological mode when doing a self-portrait? Does it become more about you than about the painting?MBM: I don’t know if you can separate them. 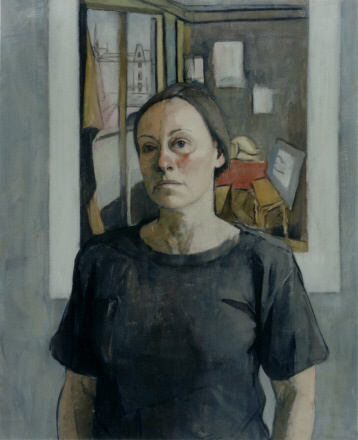 Mary Beth McKenzie, Self-Portrait (Diebenkorn Poster), undated. Oil on canvas, 14 x 11 in. IG: When you’re trying to get a likeness sometimes, or trying to capture an essence of someone, you feel like, “Gee, just a little bit more of something, the addition or accentuation of a detail and I’ll have it.” But when it is myself, I think, “Oh yeah, a few brushstrokes and I’m there. The familiarity with the subject makes it seem more direct. MBM: There is always the model issue. You have models for a limited time. You have yourself forever. So, if you want to try something different in a self-portrait, you feel freer to take chances. I think I’ve learned a lot doing that. It’s difficult to make yourself take a break, so, basically, you are not able to be objective. I may have worked on one small self-portrait for 6,000 hours. I will look at it the next day and do another whole painting. I think every self-portrait has a hundred different self-portraits underneath. I’m always doing one. IG: You’ve always got one on an easel someplace? IG: It’s a kind of summing up of all that you are up until that moment in time. Have you ever taken them all out and looked at them in chronological order? MBM: I don’t have all of them, but I would love to do that. It would be interesting to see them all together. I would love to have a self-portrait exhibition. IG: You seem to enjoy being involved with the actual material of the paint. I mean, you don’t necessarily paint very thin. MBM: No, I really use paint. I like the physicality of it. There’s a sensuous quality to paint. I like to swing a big brush. IG: It’s so liberating. In his monograph on Titian, David Rosand quotes de Kooning: “Flesh is the reason why painting was invented.” That really struck home with me. You can’t argue with it. Painting is sensual. It’s not always expressed that way. But I’ve always felt that’s the nature of the material. MBM: At least the way I like to use it. Which doesn’t mean that I don’t like things that are not painted the same way. Mary Beth McKenzie, Beñat, undated. Oil on canvas, 64 x 48 in. IG: Returning to what we were talking about earlier, I don’t think there is any mistaking a Mary Beth McKenzie painting. You’ve established who you are. Let’s face it: your work has your signature. I’ve always said that the irony of art is that the more objectively you see, the more unique your own expression. I think the whole notion of intimacy is really so much of why art is necessary—to allow artists to be intimate with their subject matter in a way that only art can. Do you have any revelations about things like that when you’re painting? All of a sudden, when you’re really feeling connected to your subject, you go, “Wow!” There is an awakening that is really great. MBM: Sure, but I don’t think anything in painting is verbal to me. I don’t think I set up knowing how I want the painting to come out or what I want to say. Somebody might interpret a psychological content later, but I am not thinking about anything like that at all while I am painting. To me, it is all about the abstract qualities: the design, the abstract patterns and relationships, the colors, the shapes. And actually, in the end, I think that is what’s expressive with any painting. You don’t just set out to make somebody sad. I don’t think it works that way. I don’t even think you want to know what it is about. You’re finding your way through it. IG: When is a painting finished? MBM: I think you don’t have anything to do with that really. It finishes itself. It sits in your studio and glares at you, especially if you turn it away or surprise yourself. If something doesn’t bother you in the end, that’s when it is finished. IG: Have you painted Tony? MBM: He’s posed for five or six portraits lately. He’s in the triptych. He didn’t used to want to pose because he was so busy. But I think now he sort of enjoys being part of the work, probably spending the time. He’s lucky he is allowed in the studio. He’s always got an opinion on another painting while he is posing. And I’m like, “I didn’t ask you. Who asked you that question?” But you have to be strong not to let those things throw you. When you are in the middle of a painting and you don’t know where it is going, you know influence can be really bad. A really good comment from Tony is, “That’s not bad.” From him, that’s a really good comment. Sometimes I’ll ask him because he is a photographer and has a great sense of design. 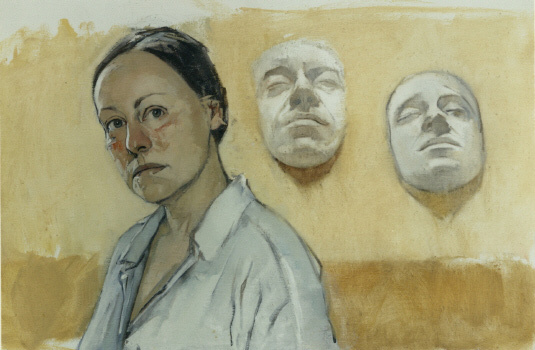 Mary Beth McKenzie, Self-Portrait (Life Masks), 1999. Oil on canvas, 17 x 25 in. Collection of the National Academy Museum. IG: Do you ever feel your students are trying to emulate you? Would you rather they try to find their own way? MBM: Some people are doing that anyway. I guess I learned, looking over my own student work, that in Robert Brackman’s class, I was just like Brackman; in Dan Greene’s class I was just like Dan Greene, in Robert Philipp’s class, just like Philipp; in Burt Silverman’s, just like Burt Silverman. I could pick them out immediately. IG: So you feel that this is the natural progression of any student, and that, sooner or later, they are going to have to find their own way. MBM: Right, and they will. But they need to get away from their influences. They need to work on their own for a few years. IG: Do you ever suggest to students that you’ve done all you can for them? MBM: When Dan Gheno was in my class early on, every year I would throw him out. I would say, “I don’t want to see you in September. You need to be painting on your own.” September would come, and he would be sitting there. IG: Really? But you wouldn’t push it. MBM: He may not have felt ready. I just wanted him to know that I thought he should be on his own. Mary Beth McKenzie, Christian, 2012. Oil on canvas, 25 x 20 in. IG: Students at the league often transfer from one to another class. It’s a sort of “hybridization” of artists. It’s an environment where one can switch gears, bring one experience to bear on another, and sort of meld the two to arrive at something that is much more personal. I think the magic of the league is that that those possibilities exist for anyone. Do you think there is any other institution where this kind of experience could be taking place? MBM: I don’t actually. I think it is really wonderful when students pick their teachers. I was on a journey with Brackman and Phillip and everyone else I studied with. I wanted to study with them; I didn’t want a school. IG: Exactly. For you they were the school. MBM: Most programs now counsel people on what they should take next. Be your own person. Go out there and choose what you want. You don’t have to do it because of a committee, or for a piece of paper. IG: You have people who have MFAs who have to pay for their education after the fact. MFAs often don’t have the skills that a professional artist needs. MBM: I would say I get a number of people who really want to paint and are driven. Some are MFAs; some are not. Some have the skills needed to become a professional artist; some don’t. In each of my classes, there is always a small group that is really serious and they raise the level of the class. Discipline is really important, but you might get somebody who’s great and really motivated while they are here, and then can’t get it together after that. Or they are painting for the wrong reasons. There are many components. It is almost impossible to make a living, if you want to do what you want to do. I don’t know how they will figure it out. IG: Some will, some won’t. MBM: A lot won’t. You get a lot who want to be successful, but let’s define success. For me that means always painting exactly what I want to paint. For that you need to be ruthless. IG: Ultimately, it is still about the individual. In this day of what determines success, it is the institution that supports the individual. Developing professional artists is just one small part of the league’s success. MBM: I don’t know exactly what professional means and again we have to define success. I always stick by this: My first teacher, Jose Cintron, once took me aside and said, “OK, you’re here. Where do you want to go? Straight ahead? Better work? It’s solely about the work you want to do. If you decide that, say, you have to accept a commission, it will take you in another direction. That may not seem so bad at the time, but once you’re out there, there’s no way back to here.” He was telling me to be really careful about every choice I made. 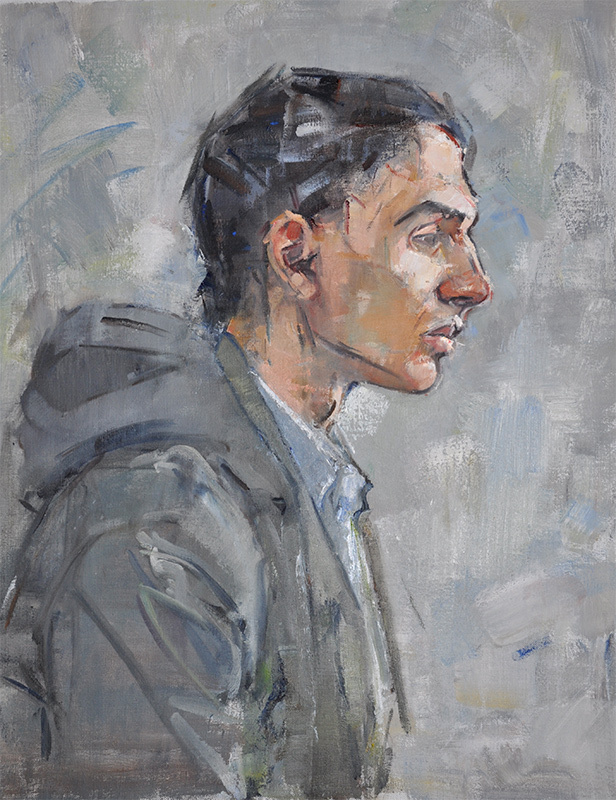 Mary Beth McKenzie teaches painting and drawing at the Art Students League of New York. You can see and read more on her website. Ira Goldberg is the executive director of the Art Students League of New York.